The Purpose of a Fence | Geo Brothers Fence Co. The Purpose of a Fence – Geo Brothers Fence Co.
Posted on June 8, 2015 June 8, 2015 by Robert G.
There are lots of reasons people put up fences and most make practical sense. For many of the same reasons landscaping is installed at homes – privacy is usually the number one reason. 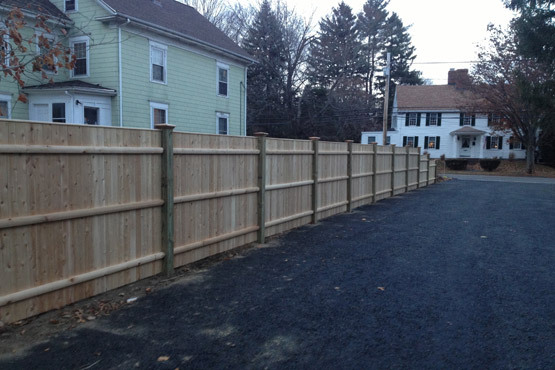 Fences are used as a visual barrier from traffic and from neighbors’ yards. They are used for security – to stop any intruders or trespassers. A fence keeps kids and dogs safe. It can protect others from a pool, Jacuzzi or pond. A fence can help muffle sound as well as break wind, usually in unison with bushes and other landscaping. A fence can contain blowing leaves, drifting snow, and trash. A fence delineates your property from your neighbor’s and solves lots of conflict in return. Remember the famous saying “fences make good neighbors”? A fence can define a property and give it the last piece of curb appeal needed to complete a design. Fences are used to help sell homes. They can block unsightly neighbors’ yards or secure a dangerous drop-off that may sway a prospective buyer with children to pass on your property. Why do you need a fence? Give the experts at Geo Brothers fence a call. We have the answers you are looking for and are happy to meet with you to discuss your options.